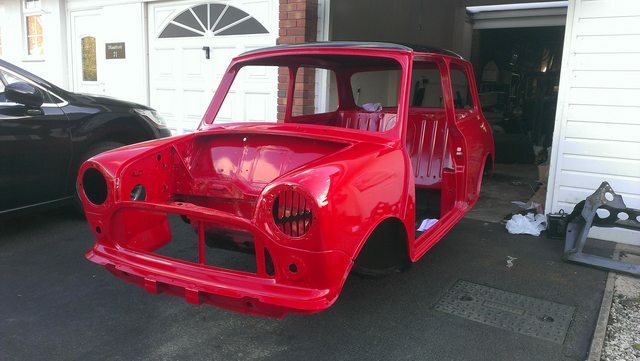 The Mini was sent to the painter on wednesday 16-07-2014. After the blocking we gave the bare/thin parts a fresh coat of primer. Both subframes returned from sand blasting and powder coating. Like new! And ofcourse the door hinges. Today the roof of the body was still being sprayed black (Colour Black BK1) and tomorrow the paint is done! Edited by Tefflar, 24 July 2014 - 08:44 PM. love the colour, thats what I am hoping to put on mine too! good job! Edited by Tefflar, 25 July 2014 - 05:15 PM. Very nice indeed Tefflar, fancy swapping it with my mk2 shell ? gorgeous, I really like the colour! He even stopped on the way back to take some more photo's! Those outside photo's really show what a dark red it is. With the Mini's curves and reflections it's showing off different colours from any angle. Can't wait to bolt on some shiny new chrome on it! Sadly not much progress so far. My coach builder has been very busy and I have been working for 1,5 years in a very undermanned position. Because of this I had no energy left to do anything myself nor complain to my coach builder for the lack of progress. Found a new job a few months ago so all is better now. Anyway: The build up has finally started! Jeroen Klomp from 7Heaven already dressed up my poor bare Mine with some gear he had laying around. The roof rack is mine though, sand blasted and powder coated. I don't have any front seats yet so it was nice to see some options. He tried to convince me but the roll cage isn't going in! The assembled sub frame on the picture below isn't mine. Mine wasn't ready at the time. The wheels aren't connected but the help to make it look like a Mini again. Sand blasted and powder coated front sub frame build op build up with new rubber cones. Top arms and hubs sand blasted and spray painted. Lower arms, tie rods and Hilo's are all new for the perfect setup. Sand blasted and powder coated rear sub frame also build up with new rubber cones. Radius arms refurbished, sand blasted and spray painted. The radius arms have been made adjustable and again Hilo's are placed. New brake back plates, brake cylinders and brake shoes complete it. Edited by Tefflar, 18 May 2015 - 09:08 PM.